At the Gateway Cities English Springer Spaniel AKC Trial on a hot November 13, 2016, HVOC, Frankie worked distance for a 3rd-Place Q in Master JWW (5 MACH pts.)! Despite the heat on 10-8 & 9, 2016, at the ACSD CPE Trial, HVOC, Frankie Q'd 3 out of 5 in Level 5: lst Place Jackpot, lst Place FullHouse and lst Place Standard! 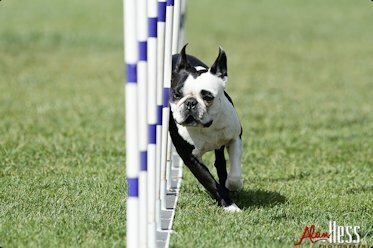 On a hot/humid weekend (August 13 and 14, 2016) at Doyle Park, Frankie Q'd (lst Place) 6 out of 12 ASCA training/proofing runs and attained his Regular Agility Standard-Elite title! Frankie celebrated the 4th of July 2016 weekend at Liberty Station with 4 Q's out of 6 runs with a Double Q (18 MACH pts. 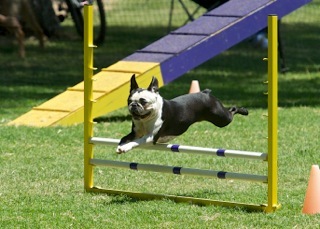 STD) and Master Agility Excellent (MX) title on the 4th! On May 21, 2016, Frankie Double Q'd with 16 MACH pts. 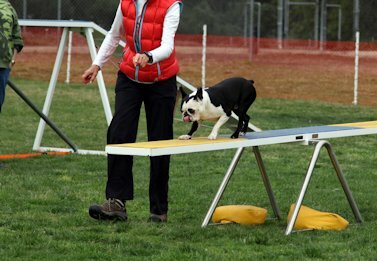 MSTD and titled "MJB" (Master Bronze Jumper) at the San Diego Rhodesian Ridgeback Club AKC Trial, Hourglass Community Park, San Diego. 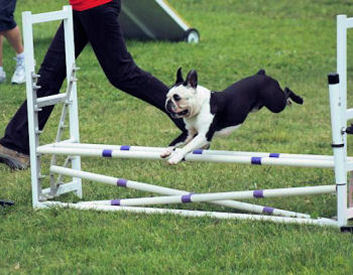 Jumpers Agility Standard-Elite (JS-E), Regular Agility Standard-Open (RS-O) and Gamblers Agility Standard-Elite (GS-E)! At the UDAC CPE Trial, April 23 and 24, 2016, at Lake Wohlford, Frankie Q'd four out of six: Wildcard Level 5 lst Place, FullHouse Level 5 4th Place, Standard Level 5 lst Place, and Colors Level 4 lst Place. Frankie, clearing and layering jumps to "Q" (10 MACH pts.) 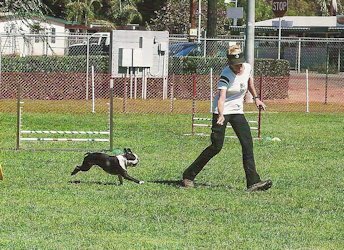 Master J/W at the San Diego Rhodesian Ridgeback Club AKC Trial, Preble Field, March 27, 2016 (Easter). On a rainy weekend, March 5 and 6, 2016, at the Ups 'N Downs CPE Trial, Lake Wohlford, Frankie got a 2nd-Place Q in Jackpot Level 5 and Standard Level 4 (moving up to Level 5 and CL4-R title), a 4th-Place Q in FullHouse Level 5, a 2nd-Place Q in Jackpot Level 5 (non-Traditional) and a 3rd-Place Q in Wildcard Level 5. Jackpot Level 5, 2d Place; Snooker Level 4, lst Place and a CL4-S title; and FulHouse Level 5! On January 24 2016 at the Golden Retriever Club of San Diego AKC Trial, Preble Field, Frankie Q'd in MJWW. 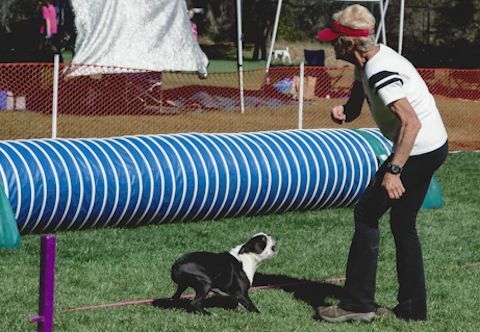 On January 17 2016, at the Agility Club of San Diego AKC Trial, Preble Field, Sandy and Frankie celebrated a "Q" on a challenging Masters Standard course with 16 MACH points ! At a cold and windy CPE Trial January 1, 2 and 3, 2016, at Doyle Park, Frankie got a 2nd-Place Q in Jumpers Level 4, lst-Place Q in Standard Level 4, 2nd-Place Q in Snooker Level 4 and lst-Place Q in Wildcard Level 5! After one of our runs, the judge came over to give me and Frankie a HIGH-FIVE before leaving the ring. 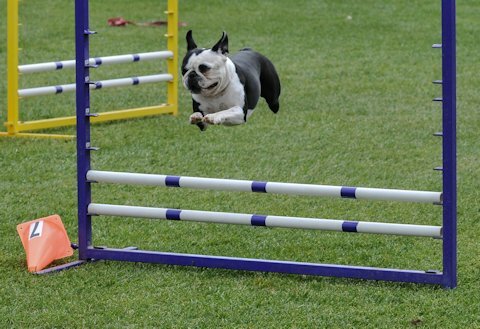 Elite Jumpers and Elite Regular on Saturday and Elite Gamblers (only 4 dogs Q'd all jump heights) and Elite Regular on Sunday ! At the CPE Trial on Nov 27 through Nov 29, 2015, Frankie and Sandy Q’d two out of three with a 1st place in Level 3 Jumpers on Friday. This Q in Jumpers got him moved up to Level 4 and attained his CL3-F Title!! On Saturday, he Q’d all three runs with two 1st places and a 2nd place. On Sunday, he Q'd all three runs with a 1st, 3rd, and 4th place. 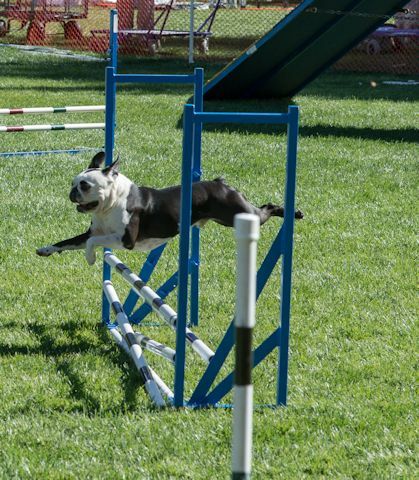 At the Ups 'N Downs Agility Club CPE Trial, 10/31 and 11/1/2015, Frankie Q'd 4 out of 6 with three lst Places, a 3rd and a move-up to Level 5 FullHouse! At the Golden Retriever Club AKC Trial on a hot/humid June 26, 27 and 28 2015, with challenging courses, Frankie Q'd each day with 17 MACH pts. in Saturday's MSTD! 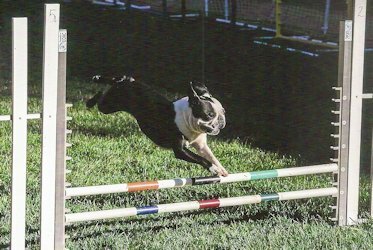 At the PDT ASCA Trial, Doyle Park, La Jolla, CA, on June 20 and 21, 2015, Frankie got a lst-Place Q in Elite Jumpers and a lst-Place Q in Elite Standard. 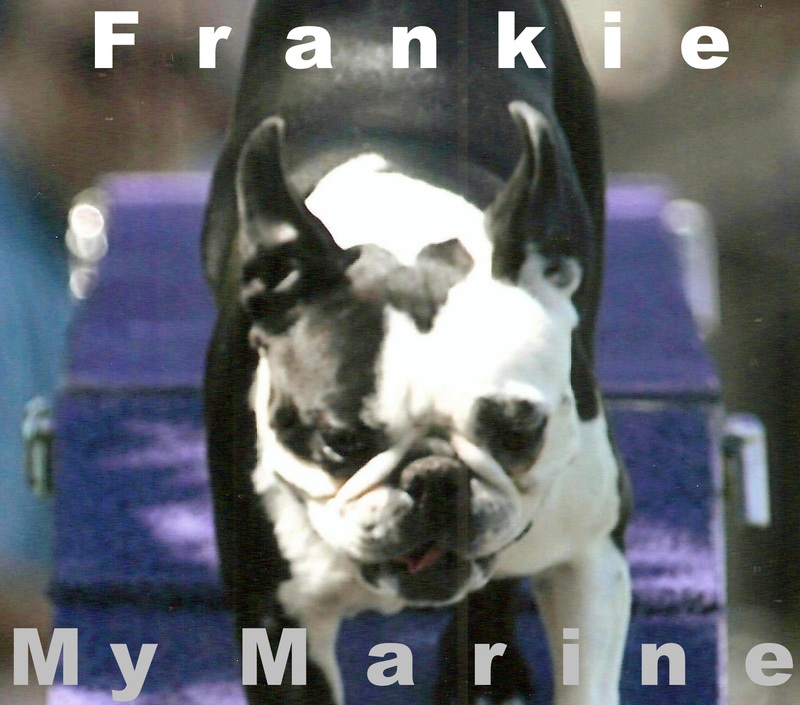 At HVOC on June 13, 2015, Frankie Q'd in MJWW with 8 MACH pts. 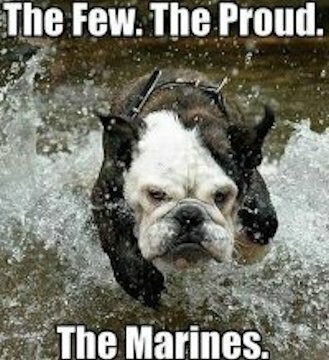 on a hot/humid day! On Sunday, June 7, 2015, at the Standard Schnauzer Club of Sothern California AKC Trial, Rohr Park, Frankie took a lst-Place Q in Masters JWW (11 MACH pts.)! 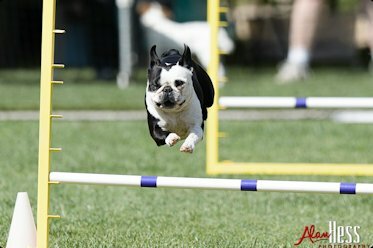 At the ASCA Trial on Saturday, May 2, 2015, Doyle Park, Frankie got two lst-Place Q's in Elite Jumpers and a lst-Place Q in Elite Regular (3 out of 3)! Frankie Q'd 5 out of 6 with a 2nd place in Jackpot Level 5 + Judge's kudos at the finish line (only 3 Qualified all jump heights in Jackpot) , and lst Place in Standard Level 4, Colors Level 4, Wildcard Level 5 and Standard Level 4. Frankie attained his "MXJ" title with 16 MACH points! Frankie got three for three lst-Place Q's (one Elite Regular and two Elite Gamblers). 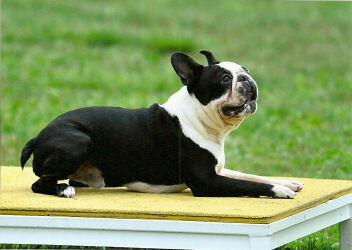 Frankie was one of only two dogs all heights to Q in Elite Gamblers Rd. 3! On a hot/humid 4th of July, 2014, running fun/very challenging courses, Frankie got his first Double Q (20 MACH pts.) 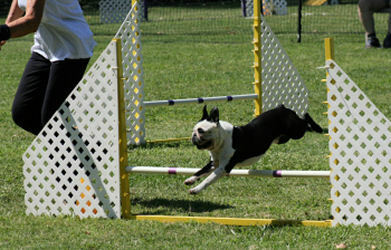 at the Agility Club of San Diego AKC Trial, Liberty Station! At the Golden Retriever Club of San Diego AKC Trial on Saturday, 6/28/2014, Liberty Station, Frankie attained his AX title on a challenging course with another lst-Place Q! 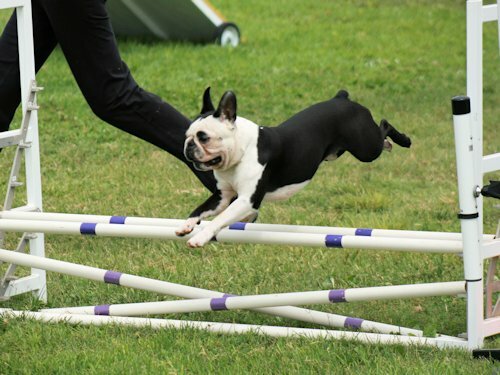 On Sunday, May 4, 2014, at the PDT ASCA Trial, Doyle Park, Frankie truly got a lst-Place Q as the only dog to qualify in Elite Regular Rnd3, all jump heights! 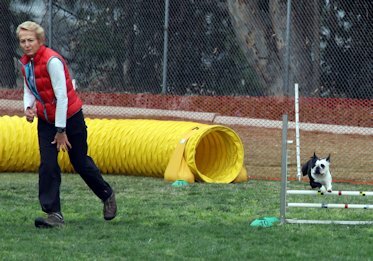 At the Agility Club of San Diego CPE Trial , HVOC, Escondido, April 5 & 6, 2014, Frankie got 4 out of 6: FullHouse Level 3, 2d-Place Q, moving up to Level 4; Standard Level 3, lst-Place Q, moving up to Level 4 with a CL3-S title; Jackpot Level 5 lst-Place Q; and Jackpot Level 5, 2d-Place Q! 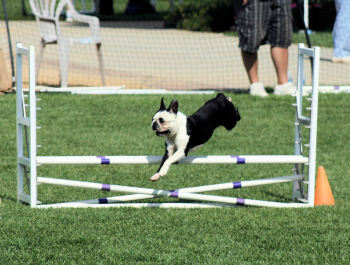 On Sunday, March 30, 2014, at the Agility Club of San Diego AKC Trial, Liberty Station, Frankie got a lst-Place Q in Excellent Standard! Keeshond Club of Southern California AKC Trial, Walnut Grove Park, San Marcos. 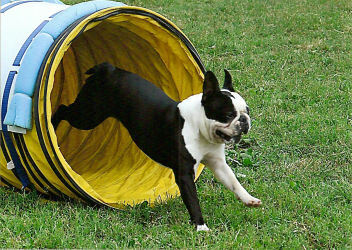 On Sunday, November 3, 2013, at the Ups' N Downs Agility Club CPE Trial, Lake Wohlford Canine Ranch, Frankie placed and Q'd, moving up to Level 5 in Jackpot and Wildcard. 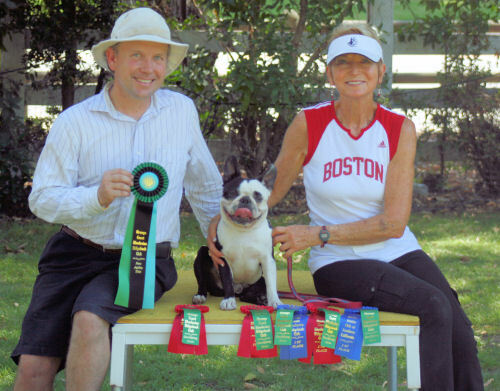 On October 6, 2013 at the Agility Club of San Diego CPE Trial, Frankie attained his CL3-H title. 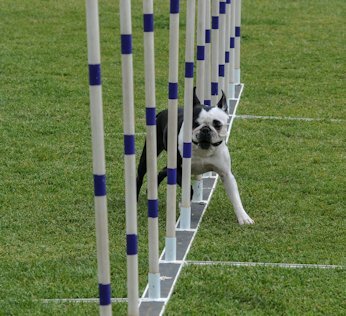 On Sunday, August 4, 2013, at the German Shepherd Dog Club of San Diego AKC Trial, Frankie took a lst-Place Q in Excellent Standard on a very challenging course--fabulous run! On Saturday, June 29, 2013, at the Golden Retriever Club of San Diego AKC Trial, Liberty Station, Frankie and Sandy took another lst-Place Q in Excellent J/W! 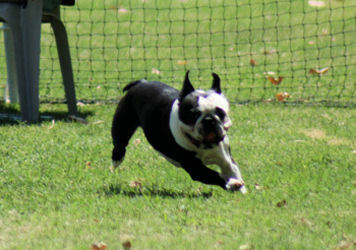 At the ACSD CPE Trial at Rohr Park 4/27 & 28/2013, Frankie Titled and moved up to Wildcard Level 4 and competed for the first time in Jackpot Level 4 for two lst-Place Q's! 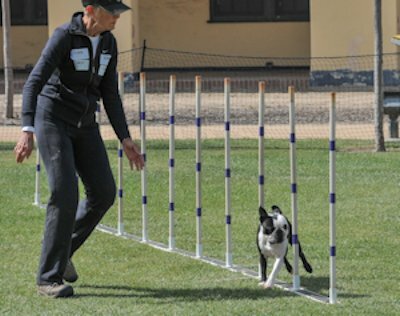 On Sunday, April 22, 2013, at the Ups 'N Downs Agility Club CPE Trial, Lake Wohlford Canine Ranch, Valley Center, Frankie Titled with another lst-Place Q in Jackpot Level 3! 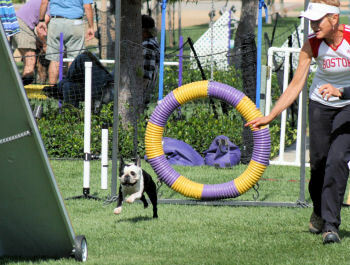 At the GRCSD AKC Trial 3/22/2013 at Liberty Station, Frankie got a lst-Place Q in XJ/W! 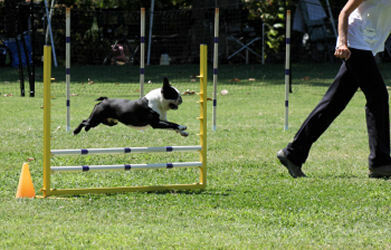 On Sunday, November 25, 2012, at the Southwestern Rottweiler Club of San Diego AKC Trial at Rohr Park, Frankie got a lst-Place Q in Open J/W and Titled! At the Orange Coast Rhodesian Ridgeback AKC Trial November 10 & 11, 2012 Frankie took a lst-Place "Q" in Open J/W on Saturday and a lst-Place "Q" and titled in Open STD on Sunday on challenging courses! 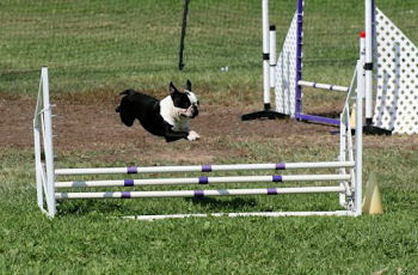 At the Ups' N Downs Agility Club CPE Trial November 3 & 4,2012 at the Lake Wohlford Canine Ranch, Frankie Q'd four out of four in Level 3 (Jackpot 2nd Place, Standard 2nd Place, Jumpers lst Place and Fullhouse lst Place)! Frankie got a 1st Place Q in Open Standard! 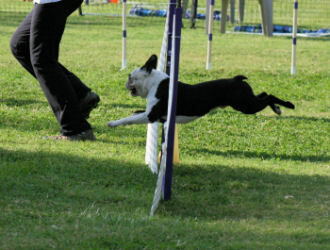 Frankie got a 1st Place Q in Open Standard on March 24, 2012! 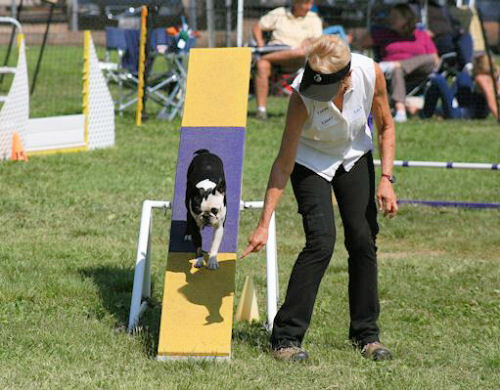 Frankie achieved his Novice Agility Jumpers title with a 2d Place Q at the Staffordshire Bull Terrier Club of American AKC Trial, September 18, 2011. At the Orange Coast Rhodesian Ridgeback Club 3-day AKC Trial, Brookside Equestrian Center, Walnut, CA, August 26 thru the 28, 2011, in l06+ degree weather, Frankie (my Marine) made his debut at 15 months with the following results: Friday a 100 lst-Place in Novice B Standard 12" (the only qualifier, all jump heights) and 2d Place in J/W; Saturday 2nd Place in both Standard and J/W; and Sunday another 100 lst Place earning his Novice Agility Title!